Earlier this month, we announced CIRR, the new industry gold standard for education outcomes reporting and truth in advertising. Hack Reactor is proud to be a founding member of CIRR, leading the path to reporting standardization in the coding bootcamp industry. 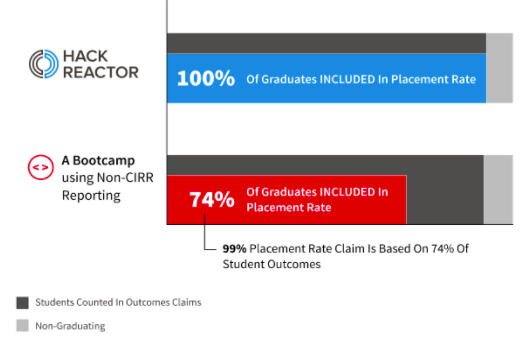 Today, I am excited to announce Hack Reactor’s student outcomes under the CIRR methodology. The key difference between CIRR and every other coding bootcamp’s reporting method is there are no reporting exclusions. If you enroll in a CIRR school, you will be counted in their placement rate, regardless of graduation status or personal decisions. This means you can skip the fine print. This is simple, straightforward, and telling (see below for a breakdown). With nearly 100 coding bootcamps in the US and the number continuing to grow, many schools state their job placements and claim transparency to stick out from the pack. But if you take a closer look, many schools use complex methods that exclude certain students from being calculated. To truly stick out from the pack, coding bootcamps need to be strict with their outcomes reporting and hold themselves accountable. For students, the first step to understanding outcomes reports is to see standards of different schools. Once you compare the different Outcomes Reports Standards, look to see if 100% of students are included within the outcomes report. At Hack Reactor, we include ALL students and leave no grads out of the picture providing you with honest, straight-forward data. Hack Reactor's vision is to transform higher education to be more transparent, accessible and outcomes-driven. We are committed to being the leading coding immersive in terms of quality, student experience and student outcomes. With the addition of CIRR and its 17 members in the coding bootcamp industry, students can feel more confident about their decision. Truth in advertising and regularly publishing student outcomes is the only way to be transparent and build trust with students and the public. All coding bootcamps are invited and welcome to join us, provided they commit to the strong standards of outcomes reporting mandated by CIRR. These commitments include: publishing detailed and complete outcomes data semi-annually, obtaining third party verification and marketing outcome statistics that are honestly calculated using CIRR’s “un-gamed, no exceptions” guidelines. As a prospective student, current student, alum, or friend of Hack Reactor, how can you help bring legitimacy to the coding bootcamp industry? Sign our petition to bring credibility and accountability to all coding bootcamps!